Today was the hot-day-in-the-desert day. And we certainly don’t say that to complain–we’ve have rarely seen the kind of wild beauty like we saw today. The wilderness of Judea is almost painfully exquisite. If you have plenty of water and a hat, that is. We drove out into the wilderness and across a checkpoint into Bethany beyond the Jordan, where some translations say John the Baptists baptized at the Jordan River. 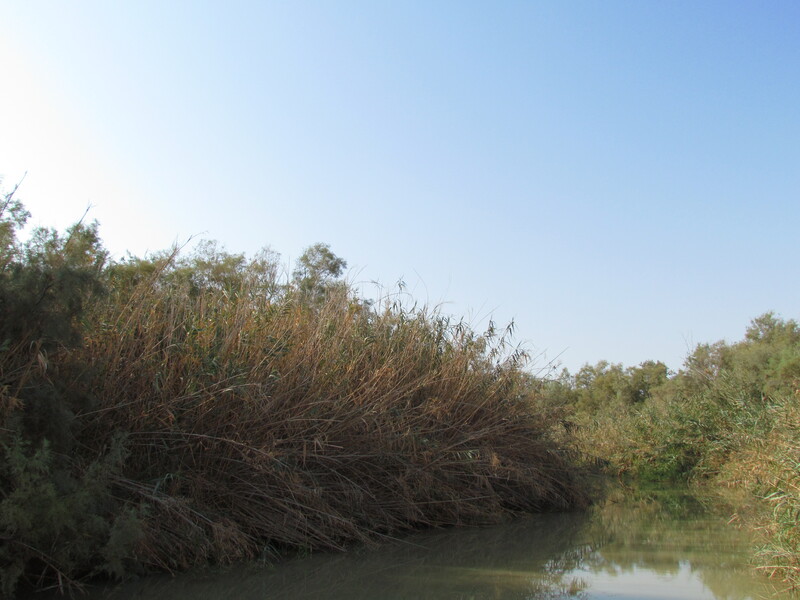 Our visit was primarily at the Jordan River, and it looked quite lovely, regardless of how it smelled. From Bethany, we drove along the Dead Sea and past the oasis of En Gedi, whereunderground springs provide a rare bit of moisture. 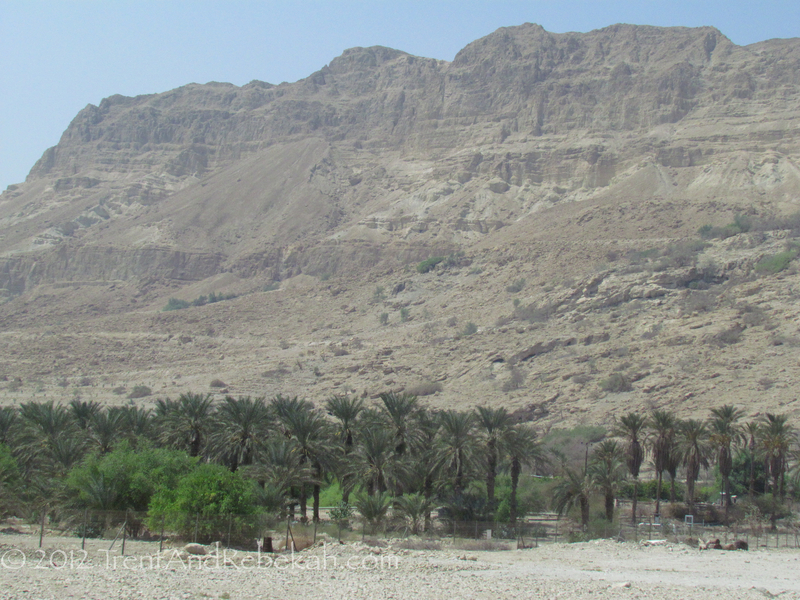 But these hills are also riddled with caves (this is not very far at all from Qumran–we’ll get to that in a minute). This was where David hid for a time, when Saul pursued him in I Samuel 24.. So it makes sense that this would be a place David would hide, in the middle of nowhere with food and water available and an excellent line of sight. It is also completely feasible to think of David hiding in a cave here, since they were everywhere. The next stop was the mountain fortress of Masada. For the history fan, this is an exciting stop. Herod the Great originally built a sumptuous palace here, complete with swimming pools and a sauna. It’s quite a logical place for a fortress, a huge isolated plateau that gives you a view for miles. No one could approach without being seen. This realization gives you a pang, when you think of the last of the Jewish rebels who fled here after the Romans destroyed Jerusalem in 70 AD. They would have watched the Romans march in, seen the runners come and go, as the ramp grew higher and higher until they were able to break down the gate. That night, around 960 people died–the men killed the women and children, and then themselves. When the Romans entered, they found 2 women and 5 children who had survived the self-massacre by hiding in a cistern. 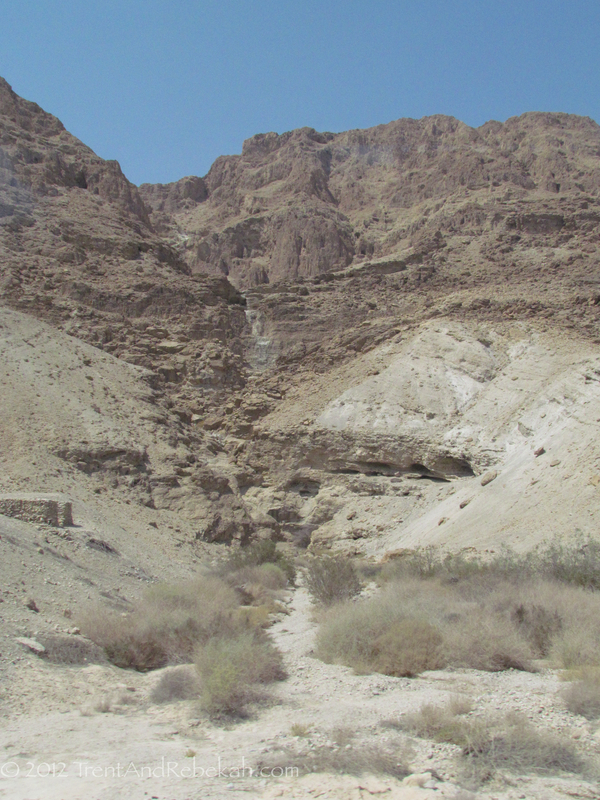 After Masada was the site of Qumran, where we explored the remains of the Essenes’ community. This was one of the religious sects from New Testament times, who was camping out near the Dead Sea while they waited for the Messiah to come sweeping over from the East and scoop up the faithful. The Romans came instead, and the Essenes fled to Masada. But first they hid nearly a thousand scrolls containing Old Testament scriptures, community laws, and eschatological philosophies. Quite some time later (like, 1946) bedouins hiding from troops happened upon the first cave. Fun times ensued, and archeologists have uncovered 11 caves now with scrolls, jars, and fragments–some of which Romans used in an impromptu confetti party while they were raiding the area. Jericho was the last stop of the day. Ah….Jericho. We could wax eloquent on the history, the controversies, and the details that makes this one of our favorite stories; but that’s for another time. The site has been rather neglected, and it was a bit sad to see beautiful ancient mud bricks deteriorating in the open air. 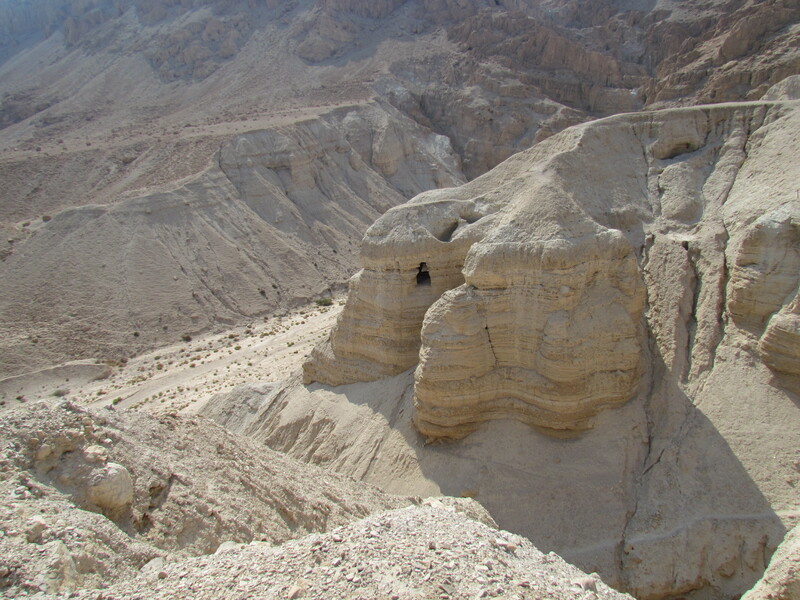 Again, this is similar to Masada, in that one can see all around. Here, you can see across the Jordan River all the way to the mountains of Moab. Imagine the people’s growing terror as they watched around 2 million people moving across the river and towards the city, and only one woman in the city had nothing to fear. This entry was posted on September 11, 2012 at 9:34 pm and is filed under Ancient History, Biblical Site. You can follow any responses to this entry through the RSS 2.0 feed. You can leave a response, or trackback from your own site.